When you've nailed it, you know. I've been baking my own granola for a while, and swore never again to buy it because a) it's super easy to make, and b) each batch is like a personal mood board -- ("Oh, last time I used almonds and currants? This time I want cashews and coconut.") But I recently broke my store-no-more promise and tried a version from KIND. I was instantly charmed. With a glance at the ingredients, my mouth curled into a grin -- before me was a list of familiar, pronounceable names -- ideal ammo for a DIY granolateer. Heat oven to 300 dgF. Combine dry ingredients in a large bowl; toss gently. Add oil, maple syrup, and molasses; stir until ingredients are evenly coated. Spread granola onto a parchment-lined rimmed baking sheet. Bake for about 30-35 minutes, stirring every 15, until toasted and golden. Allow to cool completely before serving or storing. Lasts several weeks in an airtight container/jar. Your version sounds wonderful--I, too, like the creativity of DIY granola. Thanks for posting. I would have never thought of including molasses in granola, sounds delicious. I'm glad I bumped into your blog through a different one. Delicious yet not overly complicated food. Love it. Hey just saw this new blog, it's pretty good. You guys should check it out. It's http://deliciousyumfood.blogspot.com/. Such a healthy and yummy breakfast or snack, can't wait to try this, thank you for sharing! I made a note to myself to make this when you posted it, thinking I'd want it in the depths of Fall or Winter. But I was feeling so tired today and perhaps it was because I remembered that this has molasses in it (and molasses is a good source of iron) I became obsessed with making it tonight. I can smell it baking right now and the molasses is exactly what I want and need. Thank you for nourishing us. Again. Where are you? I miss your posts! This looks delicious! I love that you add the quinoa! Such a great idea. I look forward to receiving your e-mail updates. This cranola look wonderful. I cannot tell you how much I love cranola. I munch on it for a snack and for breakfast. I blog about my family's favorite recipes, vacations, and more at: www.recipesforourdailybread.com Visit anytime! 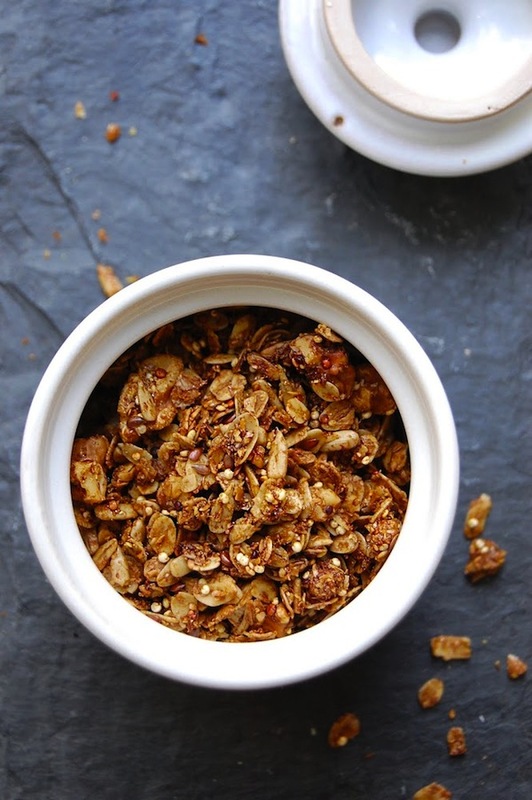 I adore homemade granola, but never tried molasses in my granola! Sounds interesting... Thanks for sharing!